DavidNews HYIP blog - News & Reviews: Tudor Games – Play with us. Tudor Games – Play with us. Our frequent readers might have noticed more activity on DavidNews.com monitor and the fact that industry is waking up after Christmas sleep. Today I’m reviewing a program called Tudor Games, which joined Golden Stage listing on DavidNews.com on the 7th of January and has been online in total for 32 days. Now I have reinvested into Tudor Games $400 and will keep you updated about the payment status of this program. The legend of this program has roots in the gaming industry. At least something different after so many cryptocurrency legends. Let’s find out more about this program and understand the pros and cons. Tudor Games is offering two investments with 1% and 4.4% interest rates. Min deposit is affordable for most kind of players in both plans - $10 and $30. Accruals are calculated only on business days and minimum withdrawal is $1. Moreover, the initial deposit is returned at the end of the term for an investment plan called “Mobile devices” – 1% for 11 business days, but included in the payments for plan “Personal Computers” – 4.4% for 35 business days. Basically, we see a program offering two different type mid-term plans. Keep reading to find out more about Tudor Games in case these investment plans seem interesting to you. 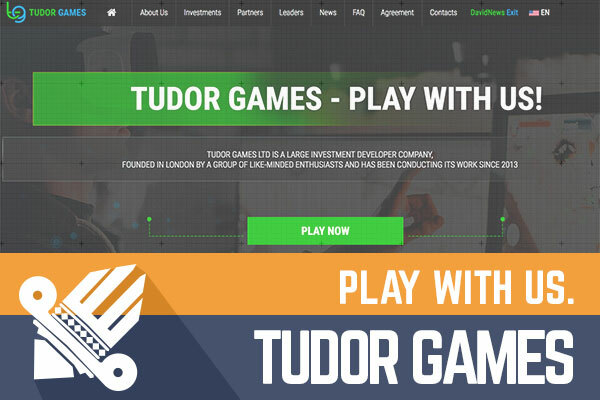 Tudor Games is another HYIP with UK registered company and address. On the “About Us” page anyone can see the registration certificate and find a link to the Companies House website – service for checking UK company registration details. The company registration certificate is still one of the “must do” things in the checklist when building a HYIP. Why? Well, it's become sort of standard a long while ago in the industry and most of the admin’s were doing it. In the meanwhile, I don’t see a correlation between long-term profitable programs and company registration certificates. However, probably for beginners registration certificates look like credibility elements. The website is built on the H-Script – service offering HYIP scripts. It has valid SSL certificate until the May of 2018. Overall impression of the website is good because the admin has paid attention to small details, which is very important in the web design. 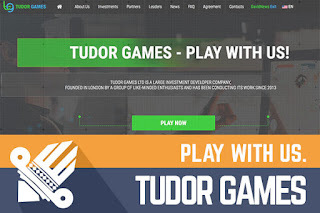 Of course, you can’t build a website that fits everyone’s taste but it’s obvious that Tudor Games admin, designer or other responsible person invested enough time in small details and the result looks professional. Unfortunately, design same as company details have nothing to do with the future of any program. However, I prefer reading interesting legends and opening websites that are not pure trash. The fun fact is that H-Script website is for Russian speaking people but on the Tudor Games website Russian version of the website is not active. Now you have the option to choose one of three languages – English, German and Polish. According to data provided by Alexa rank main source of visitors for Tudor Games is Japan, Russia, Poland, Azerbaijan and the United States. Sure, Alexa rank can be considered as a directional guidance and we shouldn’t take this data for granted. Check the FAQ page in case you have any specific question about the program. It covers many questions any potential investor might have. From the FAQ page, I learned that minimum withdrawal in Tudor Games is $1 and withdrawal request processing may take up to 48 hours, which is a lot. Unfortunately, enough for admin to end the program and keep investors waiting for the 48 hours. Of course, there is also another side of the coin – manual withdrawal confirmation takes times. Especially, if there are many users willing to withdraw money. I already gave a brief introduction to the investment plans at the beginning. There are two plans: 1% for 11 business days and initial deposit at the end of the term; 4.4% for 35 business days and initial deposit included in the payments. I’m not a big fan of business day plans because deposit term depends on the weekday when investor joins the program. Let’s say I have invested $200 in the first plan. Such deposit would make a net profit of $2 a business day and at the end of this term, the total net profit would be $22. In my opinion, such profit is comparably low when the risk of losing money is taken into consideration. Moreover, it takes almost 2 weeks to finish the investment term. The same deposit invested in the second plan would make a net profit of $108 at the end of the term. However, it takes almost 7 weeks to make such profit. After 23 business days deposit in the second plan would reach the break-even point (approximately 3 weeks’ time). For such plans, it’s highly recommended to do daily withdrawals to decrease potential loss in case program stops paying earlier than 35 business days term. Tudor Games looks like a program with mid-term plans offering comparably low-interest rates. It takes almost two weeks to make $22 from $200. I can say only good things about the website and the overall impression of admin’s work. The program has been online already for a month and it’s even harder to guess which direction it will lead. Sure, it looks fine now but we can’t predict what’s going to happen tomorrow with this or any other HYIP. Therefore, if you ever decide to make any investments, don’t invest more than you can afford to lose! Have you already made an investment in Tudor Games or even finished your first investment cycle of the first plan? Anything worth sharing? Drop a message in the chat box! Investment plans: 1% daily for 11 business days, initial deposit returned at the end of the investment term. 4.4% daily for 35 business days, initial deposit included in the payments.